This was always one of my favorite books in the series. When it begins Laura is 15 years old, teaching school, and being courted by Almanzo Wilder. She is boarding with the unpleasant Brewster family, and struggling with difficulties in her classroom, but she sticks it out so that she can earn money for Mary’s college tuition. Later, she teaches at a couple of other schools which are much more pleasant and do not involve having to live with crazy people. I was a bit confused about the school schedules though, because Laura would teach a full term and be done and then go to school herself. Her relationship with Almanzo is more formal and impersonal than I remember. Perhaps my adult perspective has just made me more aware of this, but she comes across as being totally uninterested in Almanzo – and tells him outright – but continues to go riding with him every week. When he puts his arm on the back of her seat, she becomes uncomfortable and encourages the horses to take off on a run so he needs both hands to drive them. Then, suddenly, they are engaged. Maybe she wanted to leave her complex feelings out of a children’s book, but it was just odd to not know what Laura really thinks of Almanzo, and of getting married and leaving home. During the 3-year span on this book, Mary comes home to visit a couple of times, the family moves permanently to the claim outside of town, and they even get a new-fangled sewing machine. This comes in handy when Laura and Almanzo’s wedding is suddenly moved up because his mother and sister want to come plan a big wedding. Laura and Almanzo want no part of such a thing, nor the expense, so they rush and get married right away. Who knew that such wedding-centered drama occurred back in pioneer days! Were there also bridezillas then? (I bet Nellie Oleson was one!) At any rate, while planning their hasty wedding they also mentioned not wanting Reverend Brown to use the word “obey” in their ceremony, which he had apparently stopped doing anyhow. How modern! There was enough awkwardness in their relationship that the book wasn't quite as wonderful as I remembered, but I still enjoyed it. The next - and final - book I didn’t like much as a kid. 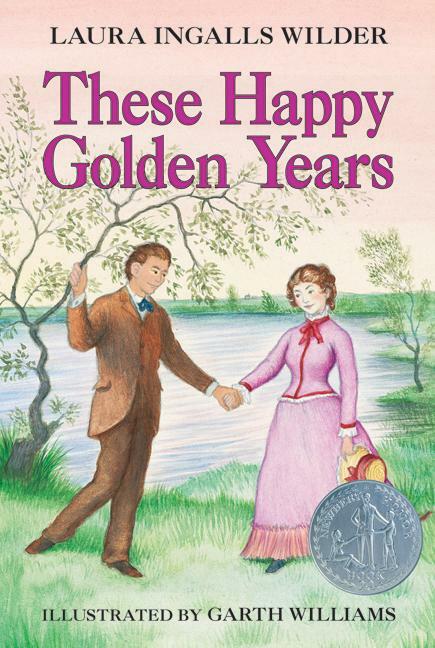 It chronicles the early years of Laura and Almanzo’s marriage and I just remember them struggling and having lots of troubles (in particular, I remember that their house burns down.) But I look forward to reading it as an adult because I'm sure I'll see it in a different light.